Hydraulic Lime Production Coming Full Circle? Natural hydraulic limes (NHLs) are now used widely for conservation work. We know that limes with hydraulic properties (literally, the ability to set under water) were used in the UK in the past, but are modern NHL mortars suitable for replicating historic mortar or maintaining historic fabric? To answer these questions, we need to consider the nature of the building lime used in the past and compare it with the properties and performance of NHLs. From before the medieval period to the beginning of the 20th century, limestone for lime burning was mostly sourced and burned in kilns close to the construction site. The type of lime produced varied from place to place depending on underlying geology, but most were low strength. Even limestone which, owing to its composition, could have yielded a faster, stronger-setting hydraulic material if burned at high temperature was usually burned in small-scale kilns at comparatively low temperatures. Therefore, the lime produced did not generally achieve a hard or rapid set. The second half of the 18th century saw increasing demand for civil and military engineering structures and industrial buildings. These specialist applications, including bridges, canal and harbour structures, warehouses and factories (some with high, relatively thin walls), demanded stronger and more durable mortars than had been used before. The civil engineer John Smeaton (17241792) carried out extensive testing of building lime, such as the Blue Lias of Somerset and south Wales, and various pozzolans, including Dutch trass and Italian pozzolana. He discovered that mortar hydraulicity was due to reactive clay minerals, either contained naturally in the source limestone or added to the lime in the form of a pozzolan. It is clear from various archive records, published technical references and analysis of historic mortars that this grey chalk lime and other feebly hydraulic limes were used across a large part of the UK for a wide range of applications, and were an important part of the spectrum of historic building limes. Although moderately and eminently hydraulic limes were produced (especially from the second half of the 18th century), they were reserved for civil engineering and military construction, or for works in continually wet environments (such as locks, harbours and water mills). BS 890 became the minimum compressive strength of the weakest hydraulicmortar in BS EN 459, and there was no longer a standard applicable to feebly hydraulic lime, despite its previous widespread use. Some suppliers market NHL 2 as feebly hydraulic but this is incorrect; even the weakest NHL 2 is significantly stronger than traditional feebly hydraulic lime (shown in red, below). It is clear that the majority of limes in general use until the last half of the 20th century were well below the strengths of those in the current BS EN standard. For many conservators and specifiers today, this alone is enough to make them steer clear of NHLs for the majority of conservation applications, although they might still be appropriate where high strength is needed for engineering structures or in persistently wet environments. Needless to say, the lack of an appropriate standard for specifying feebly hydraulic lime did nothing to maintain demand for its production. But there had already been other factors contributing to its demise. Firstly, from the late 19th century there was the rapid adoption of Portland cement as an alternative to lime for many applications. Throughout the 20th century Portland cements became progressively stronger, which benefitted largescaleengineered structures but was disastrous when applied to mortars, renders and plasters for most traditional buildings. But by the time the damage to historic fabric caused by cement was understood, the material was firmly established as the ubiquitous binder in British construction. Secondly, a combination of legal obstacles in the UK and strong marketing from European natural hydraulic suppliers compromised the financial viability of the remaining small- and medium-sized UK hydraulic lime producers. Production of grey chalk lime at the Shillingstone Lime and Stone Company ended in 1990 and at Totternhoe Lime and Stone Company Limited in 1993. More recently, production of a true feebly hydraulic lime was attempted by Singleton Birch in Lincolnshire using a local lime. Unfortunately, there was little demand for this product – perhaps because specifiers were reluctant to specify a material that did not conform to a standard – and production ceased a few years later. 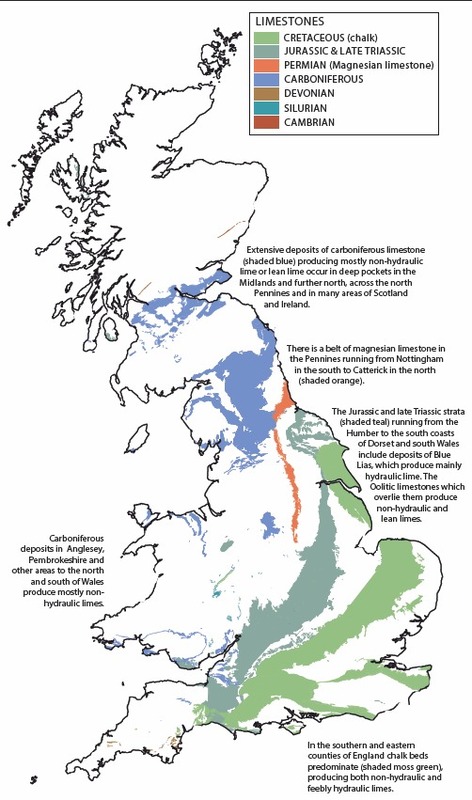 There is currently no production of traditional natural hydraulic lime from UK limestone and all NHLs are imported. Gone is the local link between geology, lime and buildings, and with it generations of knowledge and understanding of which lime was best suited to the task in hand. The method of testing binders for compliance with BS EN 459 does not give realistic data about ‘real’ mortars made with them. The ‘standard mortars’ tested are made with a laboratory sand and a water/binder/aggregate ratio that produces a mortar with unworkable consistency. The objective of this methodology (which is borrowed from the Portland cement standard) is not to produce data relevant to the end-user but simply to ensure that test results from any laboratory in Europe are comparable. There are a number of other problems with the test methodology. For example, the standard specifies different curing conditions for NHL 2 compared to NHL 3.5 and NHL 5 mortars, which suppress the strength gain of the NHL 2s. 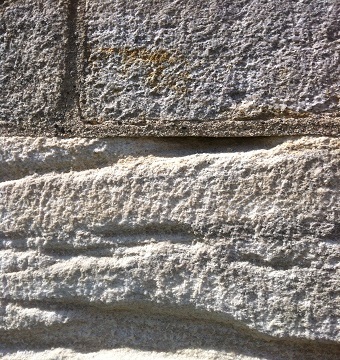 Furthermore, all testing is carried out at 28 days, but research has shown that, unlike Portland cement (which gains 80% of its strength in the first 28 days), hydraulic lime mortars continue gaining strength for well over two years and can ultimately reach compressive strengths at least twice their 28 day strengths, sometimes considerably more. 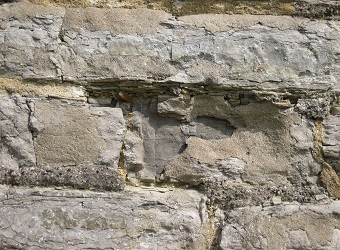 In addition to conservation professionals’ and practitioners’ concerns that NHL mortars are too strong for most conservation applications, there have been reports of other problems such as leaching of lime, migration of salts into adjacent masonry and retention of moisture in masonry walls where NHLs have been used. But there is little objective evidence to confirm whether, why or how this is happening, and little data about the properties of NHL mortars in use. To address this lack of information, Historic England, working through the Building Limes Forum, funded a PhD at the University of Bath to assess the properties and performance of natural hydraulic lime mortars for conservation. The research, completed in October 2017, involved chemical and physical characterisation of 16 NHLs that were on the market in 2014. Mortar samples were made using a representative selection of 11 of these. The aim was to learn more about the properties of ‘real’ mortars, rather than the ‘standard’ mortars used to test compliance with BS EN 459, so the samples were made using one part dry hydrated lime to two parts (by volume) well-graded silica sand mixed with sufficient water to obtain a workable consistency. They were then cured in controlled conditions and subjected to a range of tests to determine their properties. The results were surprising. At the end of 28 days, the two mortars with the highest compressive strength were those made with two brands of NHL 3.5. All the NHL 3.5 mortars and even one of the NHL 2 mortars were stronger than the weakest NHL 5 mortar. months and at varying rates. All NHLs commonly available in the UK have now been tested, and full details of each will be released by Historic England after consultation with their manufacturers. and at an independent commercial laboratory. Neither batch of NHL 5 met the minimum strength required by the standard, and results from the two labs varied significantly. This is further chart showing evidence of the inconsistency of NHL binders and the fact that classification according to the standard cannot be used as a reliable guide to mortar properties. The situation proved to be even more surprising when the strengths of mortar samples at two years’ age were measured. The strongest sample was still an NHL 3.5 mortar, but the third strongest was an NHL 2 mortar, which had overtaken three NHL 3.5 and two NHL 5 mortars. In fact, whereas most of the NHL 3.5 and NHL 5 mortars gained strength fairly slowly after 90 days, all but one of the NHL 2 mortars continued gaining strength at a steady rate, overtaking many of the mortars made with binders in a higher strength class, including the mortars made with NHL 3.5 lime from the same manufacturer as each NHL 2 being tested. 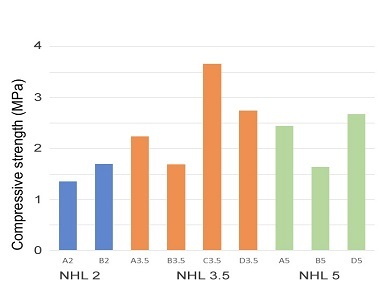 This demonstrates that not only is there significant variation in strength between limes from different manufacturers, but that even within an individual manufacturer’s product range, the NHL 2 binder may end up stronger than the NHL 3.5. To validate these results, ‘standard’ samples of mortars were made and tested at the university and by an independent commercial laboratory, strictly in accordance with the standard methodology required by BS EN 459. The binders used were all from the same manufacturer, but from different batches purchased from different suppliers. Both the NHL 2 samples tested exceeded the 2 MPa minimum compressive strength at 28 days required by the standard, although the values achieved by the university and the commercial laboratory were significantly different. 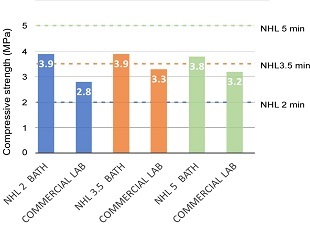 While the values obtained for the NHL 3.5 were closer in both labs, the NHL 3.5 tested at the commercial facility failed to meet the minimum 3.5 MPa at 28 days specified by BS EN 459, and the NHL 5 tested in both labs fell far short of the required minimum strength. 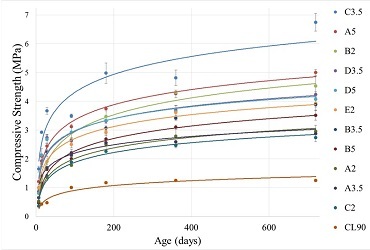 All three binders tested at the university achieved virtually the same compressive strength at 28 days when tested according to BS EN 459, regardless of the classification on the bag (see Comparison table, above). As well as compressive strength, other relevant properties assessed included permeability, porosity and capillarity. Theresearch team plans to meet with the NHL manufacturers to discuss the research findings before publishing the detailed data. CAN NHLS BE SPECIFIED USING BS EN 459? These results throw up serious questions for people specifying and using NHLs. When selecting mortars for conservation (or indeed any other purpose), to what extent can we rely on the classification printed on the bag to understand the likely long-term properties of an NHL mortar? Our research suggests not at all. If you buy a bag of NHL 2, believing that this is the weakest NHL, there is a good chance that you could end up with mortar stronger than one made with an NHL 5. Can reliable information be gained from the product data published by the manufacturers? One manufacturer publishes two-year data for a range of mortars, but this appears to be many years out of date. Another supplier’s data changed significantly a couple of years ago, with no explanation or warning on the company website. So, even if someone had taken the trouble to check the properties of those particular binders, they could find themselves unwittingly using material with very different properties a few months later. Some manufacturers don’t publish any detailed long-term data about ‘real’ mortars. Specifiers are urged to request or demand better test data from manufacturers. This may help to exert pressure on the manufacturers to produce it and to learn more about the properties of their materials. WHAT ARE THE ALTERNATIVES TO NHL MORTARS? All limes can be given additional hydraulic qualities by incorporating a pozzolan in the mix. For centuries it was common practice to modify lime mortar mixes with a pozzolan if a greater hydraulic set was needed than could be expected from local lime. In broad terms, pozzolans contain minerals – mainly composed of alumina silica and sometimes iron oxide – similar to those in the ‘active clays’ in limestones from which hydraulic limes are produced. Pozzolans were used by the Romans and records confirm that from at least the 17th century a wide range of ash from different industrial processes was added to mortars in the UK. This included ‘forge scales’ and ‘smith’s ashes’, and various imported volcanic ashes such as German trass and Italian pozzolana. Generally, coarser particles provided bulk and the finer ones reacted with the lime to form hydraulic compounds, so the pozzolan was often the only aggregate in the mortar. Pozzolanic lime mortars were superseded in the 19th century by stronger hydraulic limes and cements. Since the lime revival in the late 20th century, pozzolans have once again been used but generally as very finely ground powder added in small quantities to a mortar to modify the properties of the lime binder rather than to provide any appreciable bulk. Modern practice in the use of pozzolans is variable, and there is little evidence from research or long-term trials of current relevance to building conservation. In some cases where research was undertaken, the pozzolans tested are no longer available. Other pozzolans are variable; the reactivity of brick dust for example depends on the type of clay used to make the bricks, their firing temperature and how fine the powder is. When used as a pozzolan, the results are often inconsistent so the results of trials are of limited value. The most consistent pozzolan for building purposes is probably metakaolin, but this is a far cry from the pozzolanic mortars of the past or from the feebly hydraulic lime used in so many parts of the UK. It has been found that some unburned clays can also assist a hydraulic set. It is therefore possible that where ‘active clay’ minerals are present (either included as part of the aggregate, for example if unwashed sand is used, or incorporated deliberately with it) stable compounds may be formed by combination with the lime, imparting hydraulic qualities to the mortar. When quicklime is used in the mix, which was common practice in the past, it raises the temperature and increases the possibility of a mild pozzolanic reaction and hydraulic set. Pozzolans have huge potential to create appropriate mortars for conservation, but our understanding and experience of them is limited. Some very useful research has been undertaken over the past 16 years at Trondheim Cathedral in Norway where long-term exposure trials of a variety of pozzolanic hot-mixed mortars have informed the development of repair mortars. However, this work is sitespecificand tailored to the demands of the Norwegian climate, so although the findings are very informative, they are unlikely to be directly applicable to many UK situations without further trials. It is clear that if we wish to rely on pozzolans rather than NHLs to achieve a mortar with a feeble hydraulic set, more research is needed. 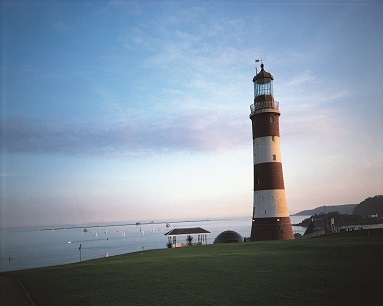 Historic England is funding further research in this area. Historic England is exploring the feasibility of re-starting production of feebly hydraulic lime. Inevitably, many obstacles will have to be overcome to achieve viable large-scale commercial production. However, there seems to be something of a grass-roots renaissance in lime burning under way. At the 2017 gathering of The Building Limes Forum, several case studies of small-scale and replica lime kiln constructions were presented, the lime produced being used for local conservation projects. There were discussions with people who have constructed their own kilns and with others who were inspired to explore the possibility. Perhaps these small enterprises, burning local lime in traditional kilns, may offer a way to obtain more authentic lime for conservation. If so, then lime production will have come full circle, giving new meaning to the term ‘the lime cycle’. CRISTIANO FIGUEIREDO completed his PhD at the University of Bath in 2017. ALISON HENRY works in the Building Conservation and Research Team of Historic England. STAFFORD HOLMES is an architect, author and former chair of the Building Limes Forum.